Even as doubts persist about the future of the euro, and talk is in the air about a possible exit for Greece, other countries have still moved forward with adopting the currency. One such country joined the Eurozone just last week. The Eurozone, European Union, and other countries using the euro. 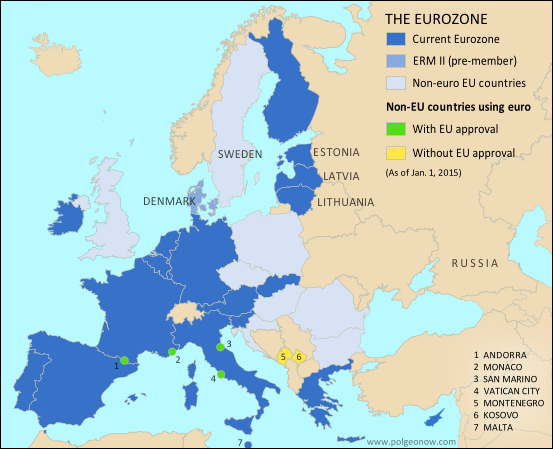 Lithuania, a European Union (EU) member state since 2004, just joined the Eurozone on January 1. This makes it the 19th member of the currency union, and the last of the three Baltic States to adopt the euro (the others being Estonia and Latvia). The last country to adopt the euro was Latvia, which joined the zone one year before Lithuania. Up to now, Lithuania's official currency was the litas. Located in northeastern Europe, Lithuania has a population of about 3 million. 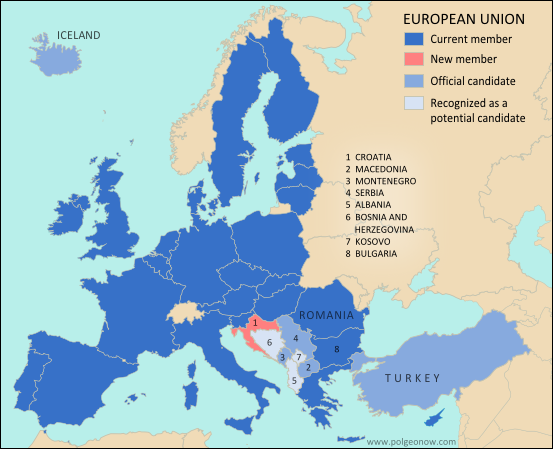 In addition to being an EU member, Lithuania is also member of the Council of Europe, a full member of the Schengen Agreement, NATO, and the Nordic Investment Bank, and involved in the Nordic-Baltic cooperation framework. For over a decade, Lithuania has been striving to obtain full EU integration, with the expectation of increasing the country’s financial stability and foreign investment. A bid to join the Eurozone in 2007 was rejected based on unstable and slightly-too-high inflation rates, and Lithuania briefly became the EU's worst-performing economy during the financial crash of 2009. However, since 2013 the country has again become one of Europe’s fastest-growing economies, and government debt is well below the EU’s 60% threshold for joining the Eurozone. Lithuania's government has also struggled with public skepticism about adopting the euro, but support grow throughout 2014. This has been attributed to Russia's takeover of the Crimea region from Ukraine, an unsettling event for Lithuanians who remember the many decades their country spent under Soviet occupation during the 20th Century. See Also: What is the Eurozone?